"Celebrating the heritage of classic Disney animation, these young renditions of your favorite Disney princess were imagined by and created under the guidance of the Walt Disney Animation Studio's most renowned animators, bringing the characters to life in the most authentic way possible." A 36 year veteran of Walt Disney Animation Studios, Glen Keane is most noted for animating some of the most beloved and enduring Disney characters. Keane trained with some of Walt Disney's most legendary animators who brought to life classic characters such as Cinderella and Sleeping Beauty. Through the course of his career, Keane has worked on many animated masterpieces and was the lead animator for the title characters from Aladdin and Beauty and the Beast. 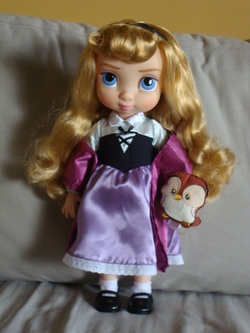 Keane animated some of Disney's most beloved princesses, such as Ariel from the Little Mermaid, the title character in Pocahontas, and as the animation supervisor for Tangled, he brought to life Rapunzel, the newest Disney Princess. Supervising animator for Disney's Frozen, Tony Smeed is an accomplished animator with credits including Tangled, Wreck-It Ralph, and Chicken Little. Smeed grew up with a passion for drawing and stop-motion, but his excitement grew when he discovered computer animation, which allowed him to bring characters to life in a whole new way. Character design supervisor for Disney's Frozen Bill Schwab is an award-winning character designer credited on many Disney hits including Tangled and Wreck-It Ralph. Schwab began drawing at an early age and was further inspired by a Disney animation book he received on his 15th birthday. Integral in bringing the Frozen characters to life on the big screen, Jin Kim is an accomplished character designer with credits including Tangled, Wreck-It Ralph, and The Princess and the Frog. Beginning his illustration career in Korea, Kim joined Walt Disney Animation Studios in 1995. A veteran of Walt Disney Animation Studios for over 30 years, Mark Henn has risen through the ranks to become one of the industry's most respected artists. Henn was inspired to become an animator after seeing the Disney Classic Cinderella and upon joining the company, trained under a team of legendary animators. Since then, Henn animated some of Disney's most beloved princesses, including Belle from Beauty and the Beast, Aladdin's Jasmine, and the free-spirited and irrepressible heroine Mulan. His most recent contribution to the lagacy of Disney Princess was animating Tiana, from The Princess and the Frog. Celebrating the heritage of Disney animation with the Disney Animators' Collection. Created under the guidance of Disney's most renowned animators and designers, these young renditions of your favorite characters are brought to life with creativity and imagination. As principal artist for the Disney Store, Steve Thompson continues to showcase his artistic talents within Disney in his latest adaptation. After many years of working on films with some of Disney's top animators at Walt Disney Animation Studios, Steve Thompson now creates memorable artwork for Disney Store collectibles, ornaments, toys, plush and limited edition dolls. As part of the team that worked on the original Disney Animators' Collection featuring Disney Princess characters, Steve brings his own unique vision to everyone's favorite fairy, Tinker Bell. "Celebrate out "small world" with a new collection of dolls inspired by the original Fantasyland attraction and one of the best-known Disney tunes of all time, "It's a Small World. "Drawing from designs and illustrations by the legendary Disney artist Mary Blair, each doll is dressed in traditional costume and sings in its native language. Collect them all to love and to share!"